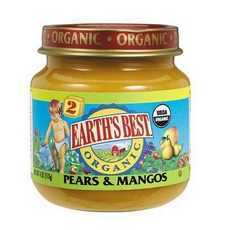 Enjoy Earth's Best 2Nd Foods Organic Pears & Mangos . At Earth?S Best, We Know Baby?S Nutritional Needs Change As They Grow. All Our Products Are Developed With A Leading Pediatric Nutritionist To Ensure That We Are Providing Your Baby Or Toddler With The Most Wholesome Foods Available. (Note: Description is informational only. Please refer to ingredients label on product prior to use and address any health questions to your Health Professional prior to use.